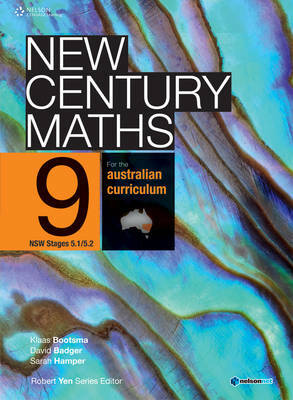 New Century Maths for the Australian Curriculum Years 7 ' 10 is designed to meet the requirements of the new Australian Curriculum. Written by the original NSW author team, these new editions retain all of the successful features of New Century Maths: Chapter outline, Wordbank, Investigation, Technology, Mental skills, Language of maths, Topic overview with mind map and Glossary. supplement to the printed text or as a standalone option for schools seeking a digital-only resource solution. *Complimentary access to NelsonNet is available to teachers who use the accompanying student book as a core resource in their classroom. Contact your education consultant for access codes and conditions.